I was attending an outdoor concert at Nathan Philips Square in Toronto , the gentleman was passing through the crowd posing for pictures for the concert goers . It was a beautiful warm September evening at approximately 18.20 . I took the shot with my Canon 7D and 70-200mm f2.8 hand held and image stabilize on . I love the look of this street person and he was ok with people taking photos of him but they were posed . I wanted a natural look not posed and I waited for him to move to another group of people and took the shot ,the 70-200 gave me the reach I needed for the shot. There were so many distracting colours around him that I decided to go with a B&W image and lose those problems. I think that B&W brings out the grittiness in his character. This particular night I only had my Canon 70-200mm and a Canon 24-70 mm with me ,and of course some lens cleaning fluid and wipes. 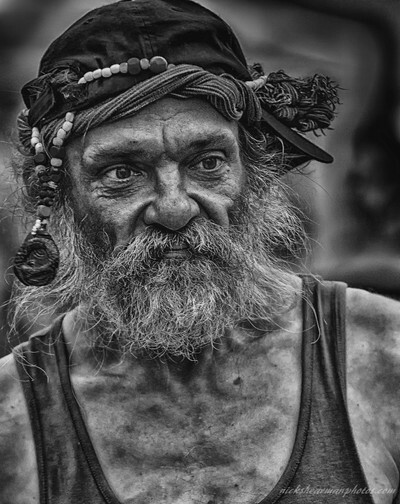 I am not a people photographer but I have this urge to portray street people , the weathered gritty look grabs me , if and when I am going to photograph people I look for that natural unaware look photo .